July has been an amazing month for coverage, meetings and SPF skin features – Thanks to the heat wave! This July marked fifteen years since our client Teoxane Laboratories entered the facial aesthetics market. They celebrated their anniversary with well-known industry professionals such as Dr Raul Cetto and Dr Sarah Tonks on the gorgeous rooftop of Trafalgar’s St James Hotel. We were lucky enough to sit down with founder Madame Taupin before the party hit full swing, as she shared her wealth of knowledge about the exciting growth of the company, having achieved so much, and sold more than nine million syringes of TEOSYAL fillers in eighty countries. The team has also been busy meeting up with some of our favourite influencers! The lovely Victoria from ‘In the Frow’ visited L’Atelier on Harley Street for an AlumierMD Radiant Peel. This is a peel that is hyper-customisable and can be tailored to individual skin type and concern, offering incredible results with minimal or no downtime. 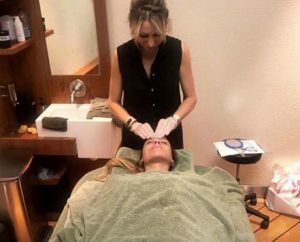 AlumierMD is also a brand that’s loved by the likes of Alessandra Steinherr, with the Bright and Clear Solution heroed as part of her ‘Sunday Night Facial’ routine. Not only are The Collyer Twins a fan of the ZO Peel but they are regulars at Paul Edmonds. This month they had a complete hair refresh with a colour, cut and extensions at Paul’s gorgeous Knightsbridge Salon. The beautiful Zara Martin also treated herself to a full holiday prep revamp at the luxury salon. And to top off a busy July our KOLs in the Beauty and Aesthetic fields have been filling pages with fantastic coverage, demonstrating their trusted expertise within the industry. Dr Sarah Shah featured in the likes of The Daily Mail, Tatler and SheerLuxe, while also receiving rave reviews from the sensational blogger Sammi Maria. Expert facialist Kate Kerr featured in Grazia, Canary Wharf Magazine and Refinery29. Last but by no means least, our hair guru Paul Edmonds shared his expertise in Marie Claire, Stylist, Woman & Home, Sunday Express and many more.